The new Watch 2 Pro has 4G/3G/2G support for its eSIM, along with Bluetooth. Not a lot of specs are discernible in the Huawei page, even when translated, so I can't tell what processor is inside, what size is the display, the amount of RAM or storage, and so on. Engadget does report that there's GPS on board as well as an HR monitor. 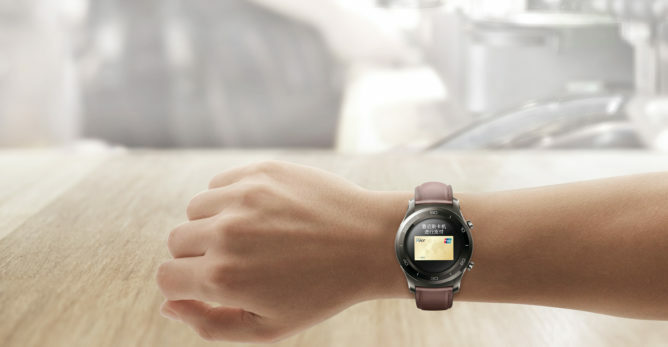 And NFC is definitely included since the Watch 2 Pro will have Huawei Pay with support for multiple bank cards, Alipay and WeChat, and what seems to be a bus/metro card in several major Chinese cities. Since the Watch 2 Pro is destined for mainland China and Google (+ all of its entities) doesn't exist there, officially, it's not clear what the OS is. It does look like Android Wear, but stripped from all of its Googley bits. For example, the voice assistant is different, but the app launcher, messaging UI, calling UI, and watch faces all look the same. The Huawei Watch 2 Pro is already available for purchase on JD.com for ¥2588 (approx. $390). Obviously, you won't have any use for it unless you live in China, but it might be a sign of eSIM support coming to smartwatches. That does make sense, since it should technically save significant space by foregoing the SIM tray. As pointed out by reader Dimitre, Android Wear does exist in China and Google has an entire documentation for developers to take into account when making apps for the country, including publishing on the Huawei App Store or Mobvoi.